SanDisk has been a pinnacle company in the mobile memory market for years. They are often the first to release larger capacity memory cards, lower prices, and currently produce all major types of mobile memory as well as new types they hope will catch on (like mini-SD). Unlike many companies that do not expand outside their nitch market, SanDisk realized that their company has the potential to combine technologies to make powerful expansion products for PDA's. 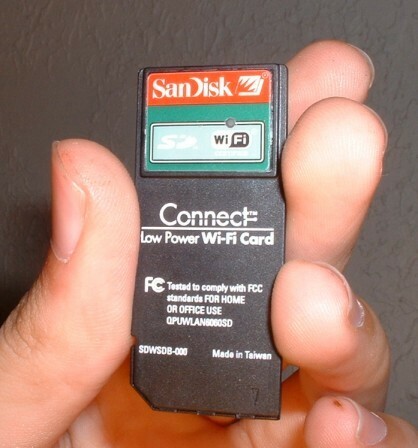 SanDisk's Connect Low Power SD WiFi Card is not only SanDisk's first attempt at SD based WiFi but also the worlds first SDIO WiFi card. The SD WiFi card is the smallest WiFi card on the market and allows a large array of previously unconnected PDA's to connect to wireless 802.11b networks. The first thing you notice about this card is the size. It is extremely little. Not only is it thin, but it is light and the antenna is much smaller that any other WiFi card. Because the card is wireless, the antenna needs to extend outside of the PDA (or phone). For such a small card, it would be nice if it could be inside, though this likely would decrease the signal strength. The card already has a lower output power that some of its competitors so a protruding antenna is needed for a good signal. 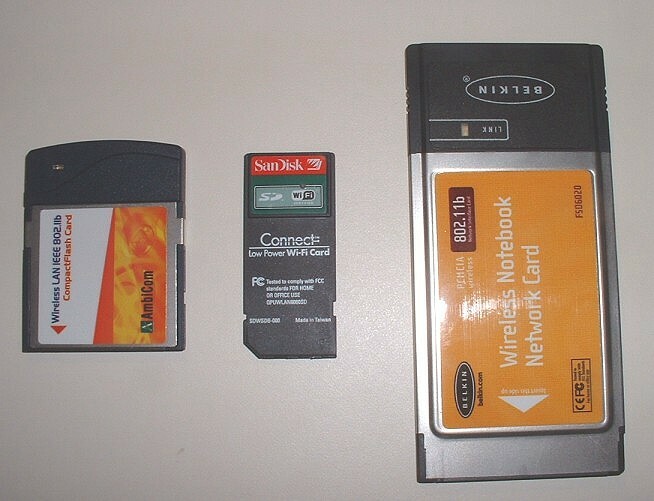 To better illustrate some of the differences in the specification of this card, the table below compares it with a standard SanDisk SD memory card, the Ambicom CF WiFi card, and the Belkin PCMCIA WiFi Card (Version 1). Width and Depth 2.1" x 0.9" 1.3" x 0.9" 2.9" x 1.7" 4.5" x 2.2"
Thickness 0.08" 0.08" 0.19" 0.19"
* Higher is better; ** Lower is better; SanDisk SD WiFi card power specifications are the SyChip's WLAN6060SD specifications (cards are the same). The SanDisk WiFi card actually has a lower power rating than all the other WiFi cards I use. I looked into the maximum power consumption for some other CF WiFi cards and they all seem to be comparable to the SanDisk SD WiFi card. The lower power consumption is great news as often new products tend to use more power than they should. Its sleep state power consumption is also below most other cards. As you can see from the chart, there is no comparison between a memory card and an expansion card for power usage, so use of the SD WiFi card instead of a SD memory will decrease battery life. 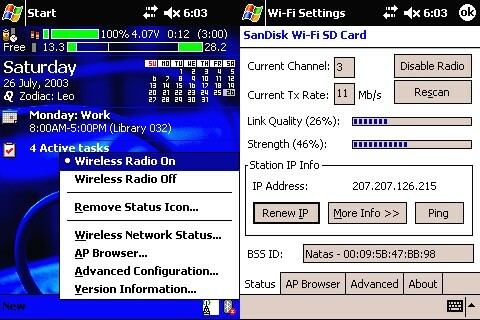 A draw back to the SanDisk SD WiFi card is its slightly lower output power. The lower power is likely due to the lower power consumption and the smaller antenna. The 2 dBm power difference was not noticeable to me when range testing the SanDisk card against the Ambicom. 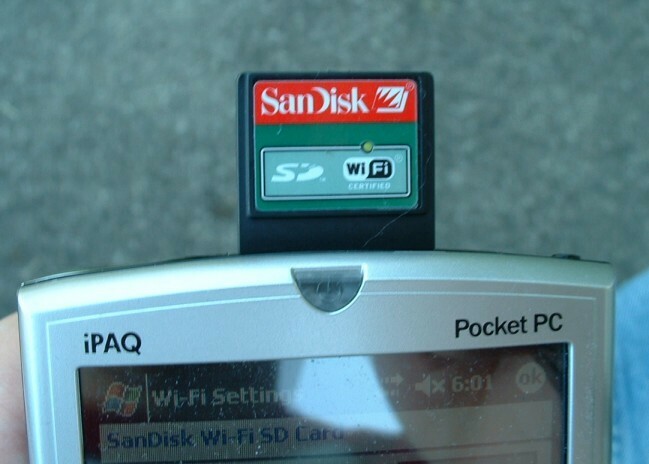 Required software for the SanDisk SD WiFi card does not come natively with Palm or Pocket PC, so a simple installation is required. 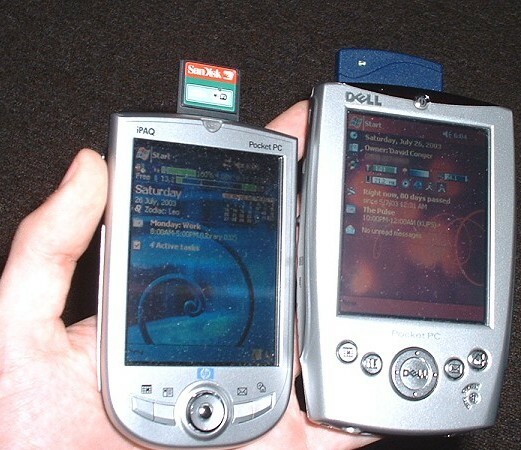 Both Pocket PC 2002 and Windows Mobile 2003 are supported. SanDisk originally planned to support the Palm OS, but at this time no drivers have been finalized. 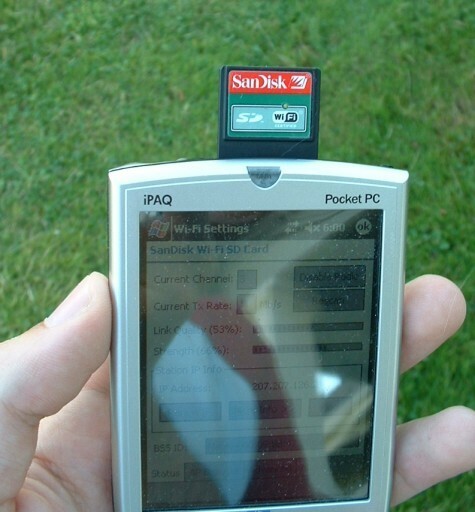 For my testing, I used the card with an HP iPAQ H1940 running Pocket PC 2003. I did not prefer SanDisk's screen to navigate to the correct installation pack and found it easier on a later installation to just find the correct setup file. SanDisk does include large multilanguage users guides, complete with a number of helpful screen shots. After the installation synchronizes to the device, a simple soft reset is need. Then plug in the card and connect to your network. The included software is great for getting connected. 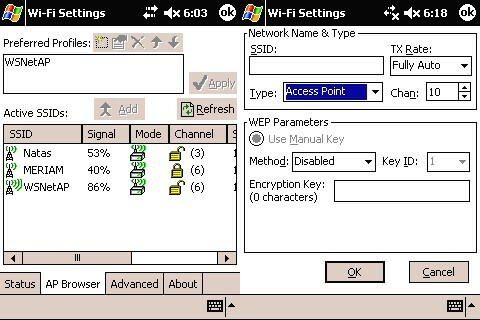 Like I have found with most WiFi connection programs, it takes a couple minutes to figure out where the settings you need are, but once you find them you are ready to go. For me, no real configuration was needed. My open access point was quickly found by the device. Pocket PC 2003 is great about notification of the connection, but a standard light is included on the card so it is easy to see when you are connected or not. One cool thing is that you can actually select specific networks to connect to, so if you live near other houses with open WiFi points, you can easily have your PDA stay on the network you want. As I stated earlier, range was not a problem. I thought the smaller size may lead to some connectivity issues, but that was not the case. The PDA community has to be extremely excited for this card to hit the market. I know I have been, and now am even more thrilled to actually have one to use especially because is works as promised. The performance of this card rivals other PDA WiFi cards. Just because it is SD, it does not lack any features nor performance. The biggest worry with this card is of course easy damage because its size, but a good case solves the problem. 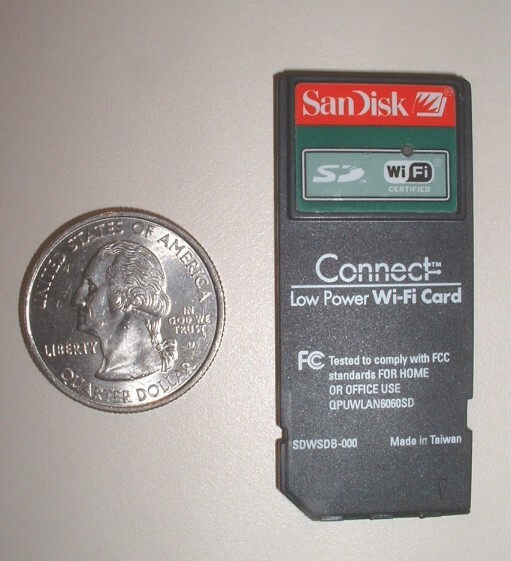 The SanDisk SD WiFi card adds network connectivity to many current and future devices (including Smartphone). Though the card is expensive (initial retail price of $130), it is a solid and extremely useful product. This means, this product is a very good product, though has some features which could be improved. This product embodies quality in its design and application, and is something I would use. Weigh the pros and cons before purchasing, but in my opinion this card is a good buy. Angel curves . Present till pojkvän . Find out about windows phone 8 data recovery here's a solution.